For the past seven years, Hyundai Motor America and Hyundai dealers across the country have proudly donated more than $6 million to help fund pediatric cancer research. The program was established in 1998 through the efforts of New England-area Hyundai dealers and their donations benefiting The Jimmy Fund at the Dana-Farber Cancer Institute. Donations are mainly generated through car sales, but dealers like Gary Rome come up with innovative ways to add their support. 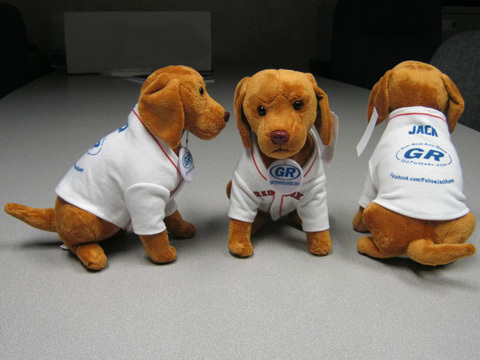 Now everyone can be a buddy to The Jimmy Fund and receive their own cuddly "Jack" in return. "Jack Rome" has been a popular character in TV commercials and at Gary Rome Kia for years. Now you can have your very own Red Sox jersey Jack and help fund pediatric cancer research. A donation of $20 gets you the cuddly Jack and all proceeds go to The Jimmy Fund at the Dana-Farber Cancer Institute. To get your own Red Sox jersey Jack Rome doll and help strike out cancer. Supplies are limited. No discount will be allowed on this product. All proceeds go to the Jimmy Fund.